This product is wear-resistant and compact. Make your life easier. 1.effectively prevent fog and continue for a long time. 2.The operation is simple and the car film will not be damaged. 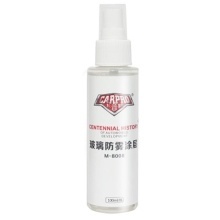 3.Easy operation, spray and wipe, deal with fog easily.Long lasting, one spray can last for 30 days. 5.It can be maintained for 20-30 days.